Elkhart Lake, Wis. — KLR Group’s Kyle Wyman held off Bartels’ Harley-Davidson/Scrubblade teammates Michael Barnes and Tyler O’Hara Sunday in a classic drafting battle at Road America to earn his second AMA Pro Vance & Hines XR1200 series race win of the season by a 0.157-second margin. 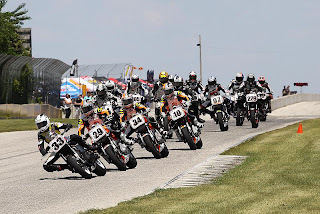 As has become the pattern in recent XR1200 series races, the trio of Wyman, Barnes and polesitter O’Hara set the pace at the front, furiously trading the lead multiple times per lap of the 4-mile-long road course. O’Hara led the first four of the race’s seven laps, if often only briefly by drafting into the lead at the start/finish line. Wyman took over the lap lead on the fifth lap and held it through to the conclusion of the contest. 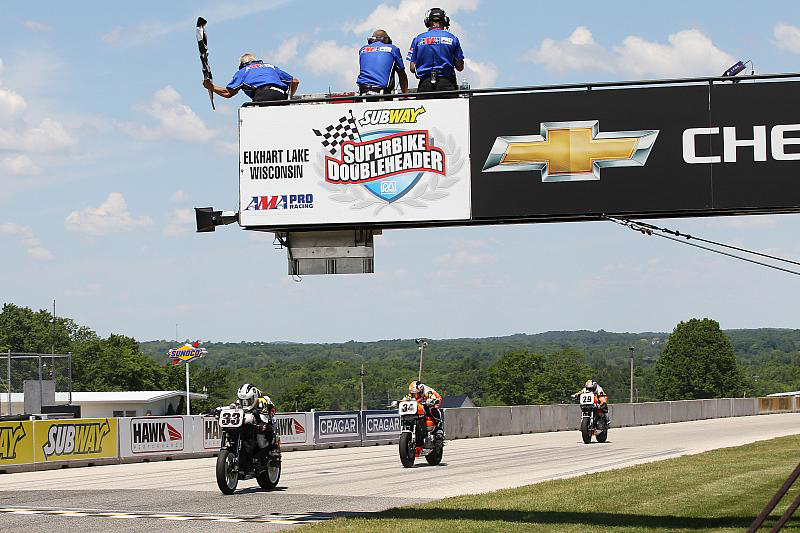 Behind the front-running trio, Harv’s Harley-Davidson’s Travis Wyman held off Benjamin Carlson (Suburban Motors H-D) by 0.008 seconds to finish fourth, with Gerry Signorelli (Kuryakyn) and David Estok (Ruthless Racing/Deeley H-D Racing) less than one second behind. XP Motorsports/Rossiter’s H-D’s Michael Corbino and Darren James (Ruthless Racing/Deeley H-D Racing) finished eighth and ninth, with Nicholas Hansen (Suburban Motors H-D) nipping Joseph Rozynski by 0.006 second to round out the top ten finishers. The next round of the Vance & Hines XR1200 series is June 23-24 at Barber Motorsports Park in Leeds, AL.